The Rebel Sweetheart. 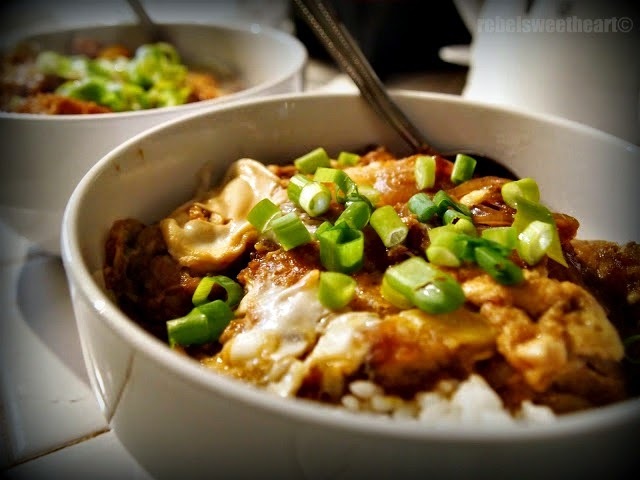 : Foodie Goodie | Katsudon. If you're following me on Instagram, then you've probably noticed that I'm into Japanese dramas (dorama) as of late. And no, this isn't a new craze that I've just discovered. It's more like, rekindling with an old flame. You see, before I got into this whole Kpop and Kdrama frenzy, I was actually a fan of all things Japanese - from anime, to music, to video games, to martial arts, to food. Speaking of which, one of my favorite Japanese dishes is katsudon. It's a donburi (rice bowl) topped with fried onions, egg, and a cutlet of deep fried pork (katsu). I've been craving for katsudon for weeks now, but since we don't have restaurants here that serve Japanese food with the authentic Japanese taste, I tried making my own katsudon instead. 1. Combine dashi, sugar, and soy sauce in one bowl. 2. In another bowl, place the eggs then lightly beat. 3. Heat a large pan over medium high heat and add the oil. 4. Saute the onions until they are fragrant and start to turn translucent. 5. Pour the dashi mixture over the onions and carrots, then nestle the tonkatsu into the vegetables. 6. Drizzle the egg over everything and then sprinkle with green onions. 7. Cover with a lid and cook for another minute, or until the egg is mostly set. 8. In two large bowls, place the rice then top each bowl with the tonkatsu and egg. Serve immediately. *Dashi is a Japanese broth used as a base in most Japanese dishes. It gives Japanese dishes the authentic flavor, and comes in granulated or liquid form. Traditional dashi is made by boiling kelp, anchovies, and bonito flakes. Wow you're so creative when it comes to dishes. The boys and I usually dine out when it comes to katsudon. :) Your kid must love this! Yay for rekindling the old flame for Jdrama! :D Anyway, I love Japanese food that I think I was one during my past life. Haha! Love katsudon too! I haven't tried making my own yet though. Still can't get a hold of premade dashi stock. PS: Where did you get your dashi stock? Thanks! That looks really good. I love Japanese food too. That looks delicious, but I don't know what tonkasu is. I have never had this dish, but would love to try it. Thanks for sharing! My kids love katsudon also! Your recipe looks so easy to do even on a rushed weeknight. Super fave namin ng aking hubby at mga anak ang Katsudon. Thanks for sharing this recipe, I will surely try sis. I have never tried this dish. Truthfully I haven't been to a Japanese restaurant in a very long time. Guess it is time to go and see if they happen to have this dish. It sounds very good! My husband's all time fave is Katsudon also. I've tried making this a few times at home but has been inconsistent. Where did you buy the dashi? Thanks Jenny! I try to stay away from pork as much as I can, but I can't say no to katsudon. Haha! I love japanese food! Will definitely have to give this a try! yum!